It took me so long to mail this letter so I added another sheet. Were supposed to be leaving for Wain Wright on the weekend. It's about 200 miles north-east of Calgary. 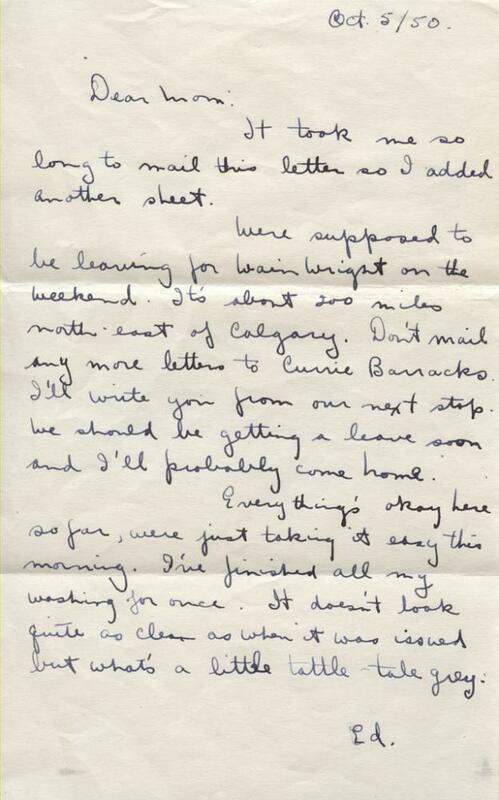 Don't mail any more letters to Currie Barracks. I'll write you from our next stop. We should be getting a leave soon and I'll probably come home. Everything's okay here so far, were just taking it easy this morning. I've finished all my washing for once. It doesn't look quite as clean as when it was issued but what's a little tattle-tale grey.